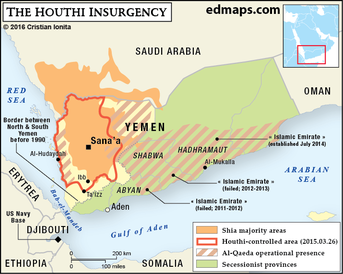 Yemen is an Arab country located in the south of the Arabian Peninsula. It verges with Saudi Arabia in the North and with Oman in the East. The western and southern part is bordered to the Arabian Sea and the Gulf of Aden. 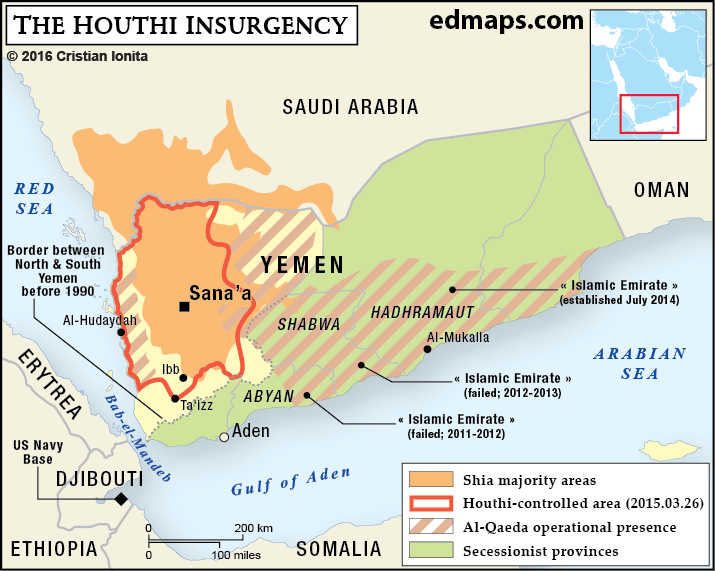 Constitutionally the capital of Yemen is the city of Sana'a, but since it is controlled by terrorists the port city of Aden is the provisional capital. Yemen is not only a developing country but also the poorest country in the Middle East. For the most part of the 20th century, Yemen was divided into North Yemen (Yemen Arab Republic), which became independent in 1918 after the Ottoman Empire had crashed. South Yemen continued to be a British protectorate until 1967. In 1990 the two states formed the Republic of Yemen. On 22 May 1990 Ali Abdullah Saleh became the first president. The young state was almost immediately confronted by a civil war. In the following two decades the Yemeni people suffered from many terroristic attacks. Especially Al Qaeda was very active in Yemen. In 2011 Yemeni revolution followed other Arab Spring mass protests in early 2011. After clashes between the police and rebels, President Saleh had to flee to Saudi Arabia and he began to lose international support. In consequence he transferred the office to Vice-President Abd Rabbuh Mansur Hadi. But he was not able to control the situation either. By 2012, there has been a small amount of U.S. special-operations troops supported by the CIA in Yemen in reaction to terroristic attacks against the Yemeni population. The government under Hadi tried to fight the many separatists but was not able to hold them back. In 2014 and 2015 Houthis took over the government in Sana'a with the help of the former president Ali Abdullah Saleh and deposed the government of Abdrabbuh Mansur Hadi. Meanwhile a branch of the militant Islamic State of Iraq and the Levant (ISIL) joined together with Al Qaeda and tried to build an Islamic Emirate and after two fails the third attempt seems to work since the two organizations established governmental structures in their territories. But behind the scenes countries like Iran and Saudi Arabia try to use the conflict for their own regional interests. Especially the international coalition lead by Saudi Arabia and supported by the United States of America intervenes massively. Not only is the conflict very brutal but it also caused a humanitarian crisis, which effects the whole Yemeni population. The United Nations Office for the Coordination of Humanitarian Affairs declared in April 2017 that “Yemen is the largest humanitarian crisis in the world,” and in August the charity Save the Children warned that one million malnourished Yemeni children were at risk of contracting cholera. 1.800.000 children face acute malnutrition! Currently Saudi Arabia and the military coalition blockade the Yemenite ports and airports, which will increase the famine even more. The United Nations Office for the Coordination of Humanitarian Affairs (UNOCHA) points out that Yemen suffers from the “fastest growing cholera epidemic ever recorded”.